Dwarf plum trees are separate trees grafted to make one. 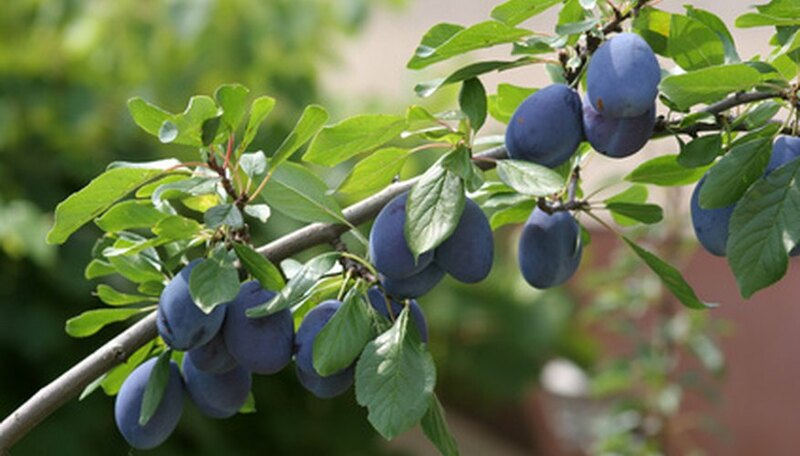 The root portion of the dwarf plum tree is of special stock to keep the tree at a small size, generally 6 to 8 feet tall. The upper portion of the dwarf plum tree is any species of plum. It is the rootstock that determines whether the tree will be a dwarf or small tree. Caring for a dwarf plum tree is much like any other fruit tree. Proper planting, fertilization, water and some spraying will be involved. Plant a dwarf plum tree in early spring after all danger of frost has passed. Choose a location that has full sun with plenty of air drainage. Dig a planting hole that is two to three times the size of the dwarf plum tree’s root ball to allow the tree’s roots to quickly gain a foothold. Loosen the soil in the hole on all sides. Mix in the nursery’s recommendation of a fruit tree planting fertilizer into the soil. Add approximately a 50 percent mix of high quality organic material into the native soil that was removed from the transplant hole. Set the dwarf plum tree into the hole. Keep the graft point approximately 2 to 3 inches above the soil line. Backfill the native soil and organic mix around the plum’s roots. Press down the loose soil around the root ball by hand. Create a soil ring around the tree approximately 24 inches in diameter and 3 inches high. Fill the soil ring three times with water to remove air left around the tree’s roots. Add mulch around the plum tree to a depth of 2 to 3 inches. Keep the mulch 3 inches from the main trunk. The mulch should fill the soil ring made in Step 4. Prune the upper limbs of the plum tree to three main leaders that are coming from the main trunk. The plum tree should have an open center to the overall appearance of the tree. Apply 1 oz. of nitrogen-based fertilizer in a 12-inch circle around the new tree before the month of June. Thin fruits from the dwarf plum tree when blooms begin to set the second year. Thin the fruits to approximately one fruit per 2 to 3 inches of limbs. Thin more if larger fruits are wanted. Spray the maturing fruits with a fungicide during the wet season of early summer. Follow all label directions on the fungicide container for mixing and application instructions. Cover the fruit ripening tree with some form of plastic pest netting to protect it from pests. Prune the dwarf plum tree in mid-winter when all foliage has dropped from the limbs. Remove any deadwood and limbs that extend beyond your upper reach. Keep the center of the tree open from any limb growth. Plums tend to bloom in early spring. Locations that will hold cold air may cause the early bloom to freeze and not set fruit. Placing the graft point below the soil will cause the rootstock to grow limbs. The limbs will be of a full size tree if allowed to grow from the rootstock. Various species of plum trees may dictate different thinning techniques due to actual fruit size. A dwarf plum tree should be of such a size that all limbs are within easy reach. The final look to a mature dwarf plum tree should be that of an open bowl type shape. Consult your local agricultural extension service for any bulletins that concern specific plum species for your area. Early harvest plums and allow the fruit to fully ripen indoors if desired. This will detract other animals from devouring the plums on the tree. Once fungus begins to grow on the fruit it is almost impossible to control unless a fungicide is applied to the tree directly. Ripe plums will attract various pests. Birds, squirrels and raccoons will be attracted to the ripe fruit and may remove much of the harvest in one single evening.